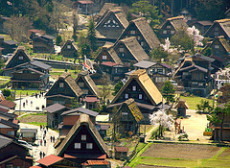 A-frame houses were built from mid Edo era to early Showa era in Shirakawa Village and Gokayama Region. The oldest houses were built 300 years ago. But many houses have disappeared, some settlements went under water by the construction of the dam from 1940's, and some settlements have lost by the fire. The number of A-frame houses were 300 in 1924, but decreased to 190 in 1961. Preserve movement has begun after 1965 by the inhabitants of Ogimachi. It was designated as National important cultural properties in 1976 and registered as world heritage in 1995. In 1997, foundation for preserving A-frame houses in Shirakawa-go was established and is doing activities to preserve the landscape. A-frame houses became well-known after famous German architect Bruno Taut (1889-1938) introduced them in his book 'Rediscoverly of beauty in Japan'. He lauded 'A-frame house is reasonable and logical from the view of architectonics' and also 'This landscape is not Japanese style. At least I have never seen it before. It seems to be rather Swiss or Swiss illusion'. By this appreciation, it has attracted world's attention. 'A-frame construction' is made by combining two side of the roofs in steep mountain shape on the beams. The roof is gabled and the surface is thatched. The weight of the roof is decentralized by the support called 'matakubi'. You can see this kind of construction in other region, but the characteristics of the house in Shirakawa is 'Gabled A-fram Construction', the shape looks as if you open the book face down. This form is to avoid the heavy snow piles up on the roof. The houses were built facing north-south to minimize the wind resistance as well as adjusting the amount of sunlight to make cool in summer and warm in winter. The difference of A-frame house from normal house is to utilize the attic as work place. From late Edo era to early Showa era, sericulture was the key industry in Shirakawa Village. So, they grew silkworms in the attic dividing the space to 2-4. The other characteristic is the shape of the roof. 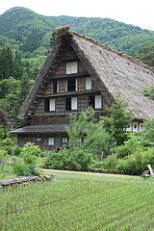 Generally the thatched folk residence has hipped or half-hipped roof, but the residence in Shirakawa has thatched gabled roof. It related to the sericulture. By bringing the wind and sunlight, it offers the suitable environment to cultivate silkworm. The beauty of A-frame comes from the life function. *There is a bus between Shirakawa-go and Gokayama but very few and reservation is required.